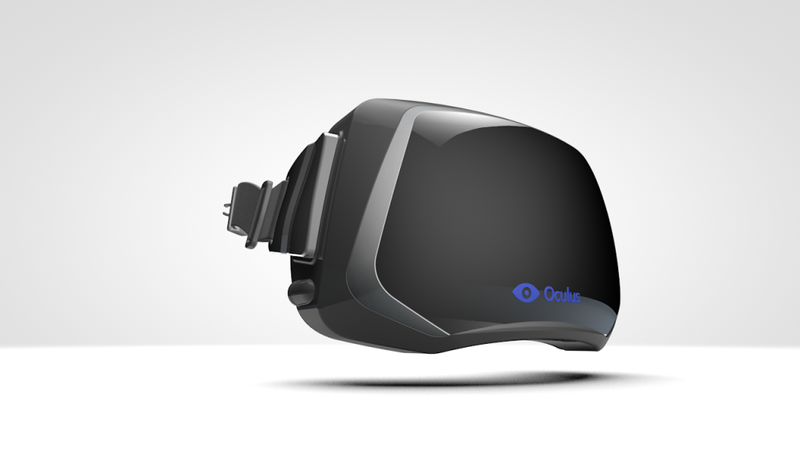 The Oculus Rift, the name of which sounds like a place where wizards do battle, is actually a piece of hardware, but potentially as exciting. Oculus Rift is the name of a virtual reality headset, designed principally for use with 3D video games, which is currently in development by a small company called Oculus VR in Irvine, California. The device is the brainchild of Palmer Luckey, who is 20, and owns, apparently, the world’s largest collection of virtual reality headsets. Yes, that Palmer Luckey. The Oculus is not yet available for consumers, but for $300 one can purchase a development kit. The development kit is for those who want to explore the technology, implement Oculus functionality in their own games, or scare small children with the frightful Rift mask itself. I understand that in the Oculus’ final form, the device will sport a sleeker, friendlier design: something worthy of a must-have consumer gadget. The prototype version of the Oculus Rift now shipping with development kits, however, is a void-black death mask, a flat, opaque rectangle of plastic obsidian that envelops the eyes and most of the face. Lenses housed within project a virtual, 3D world around the wearer. The wearer cannot see through the mask, so knowing that, it’s an unsettling thing to have an Oculus wearer slowly turn their head and find you in the room – as if, through their unreadable, 2001 monolith of a face, they have sensed an intruder. The most important thing to say about the Oculus Rift, from a consumer perspective, is that yes, it works. Basically, it does just what you’d expect a VR headset to do. That doesn’t read like superlative praise, but that ‘what’ is something pretty special. ‘What’, in this case, is achieving the promise of virtual reality. For as long as the concept of virtual reality has been around, VR has been a thing we’ve always wanted, if never actually needed, and which has forever, more or less, remained beyond our grasp. Well, this is it. I first tried the Oculus Rift with “Tuscany”, one of the official tech demos packaged with the development kit. 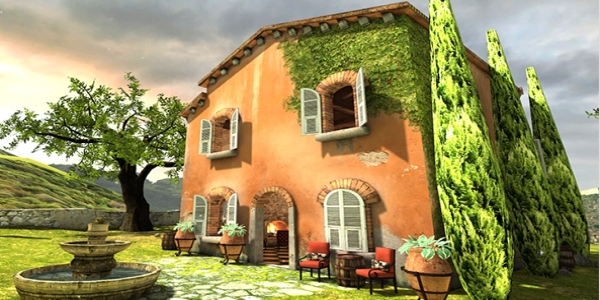 “Tuscany”, an appropriately simple bit of software, presents a 3D representation of a small, terracotta house in the Tuscan countryside for players to explore. When I put on the Rift mask, I exclaimed immediately, with no trace of irony, “whoa.” The Oculus is cynicism-defeating in that way. It is not the detail of the image that convinces (the detail is variable) but its totality. Your entire sphere of vision is fully replaced with a virtual Tuscany, surrounding you from all angles and all directions. To move your head left, right, up, down, to scramble around on the couch and look behind you: all of this maps to the virtual world and feels correct. One of my first thoughts in the Oculus Rift was, literally: what if I get trapped in here. The Oculus Rift confounds instinct. Try to look down at your hands or legs in “Tuscany”, and you won’t see them. 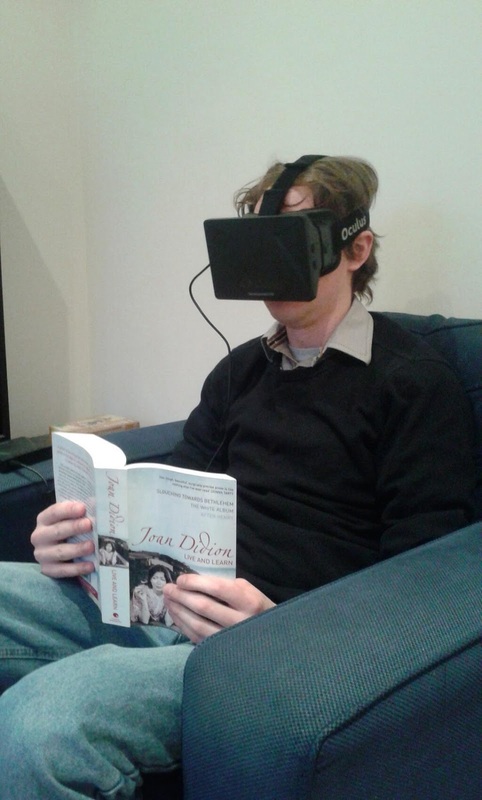 When I marvelled at some virtual books and moved to touch them, I pawed at my flatmate’s neck. It’s the kind of thing that you logically understand, going in – the technology, which tracks only head movement, doesn’t work that way – but it’s alarming for the illusion to be shattered by something as dramatic as not being able to find your limbs. Standard keyboard and mouse controls – which obviously you can’t actually see – move your avatar around in the VR space. The result is a feeling something like having your head inside of a game with the rest of your body outside it. Also, with the dual control scheme in play, a fun thing you can do is physically walk backwards while propelling your vision forward with the keyboard. Don’t do this. “Spacewalk”, another Oculus demo, puts players in the first person viewpoint of an astronaut outside the International Space Station. This one was not originally designed for the Oculus. It was built by a University of Southern California student for an assignment and fitted for Oculus support after the fact. It’s not quite the immediate showcase for the Oculus that “Tuscany” is: being in space, and locked inside a rendered spacesuit, the visual environment is less detailed and movement is restricted. Your avatar’s hands are modelled here, too, and it’s disconcerting not to control them with your real hands. Your “hands” are housed in huge grey gloves, and you can bring them before your eyes with a keystroke, which looks like giant Hulk hands are arising unbidden from the depths of space to choke your astronaut. In “Spacewalk”, despite the title, you don’t walk in space so much as gently roll yourself around by controlling the thrust and power of your suit rockets. Nonetheless, once you maneuverer beyond the station’s cobwebs of girders and panels, Earth enters full view – the sun highlighting its circumference – and the experience is suitably majestic. We’re at a point now, technologically speaking, where the basic act of looking around in a virtual world is – and read this in the strictest, literal sense – awesome. What doesn’t work about Oculus Rift doesn’t matter, because the fact, and the miracle, is that it works at all. I said that the Oculus Rift was cynicism-defeating, which isn’t entirely true. What the Oculus is capable of right now feels like something truly new, and like all new things, will inevitably be taken for granted. The way things go, we’ll find, and probably not too long from now, something like “Tuscany” to be limited, even crude: the virtual reality equivalent of the train hurtling toward the cinema screen, or Mystery House. Hold on to this point in time, is all I’m saying, because this point in time is the one where virtual reality is still like looking at the planets. Really, the virtual reality that the Oculus Rift takes one to isn’t Tuscany or space or wherever, but the reality of a child: exploring the world without guile, in a state of constant wonder and learning, playing for the sake of play. The whole concept of virtual reality, as it has endured for so long in the popular imagination, has an innocence, even naiveté, to it. Modern society, for decades, has portrayed VR as a symbol of the future – a certain kind of future in which virtual reality is an everyday consumer good, like hovercars, robot helpers and moon colonies, that we assume the future will provide us. The fact that VR’s been unachievable for so long – at least for the general consumption – has only enhanced its status as a wishful thinking, science fiction thing. Virtual reality is a signifier of a utopian future made perfect and peaceful by technology: a world in which everything is okay. 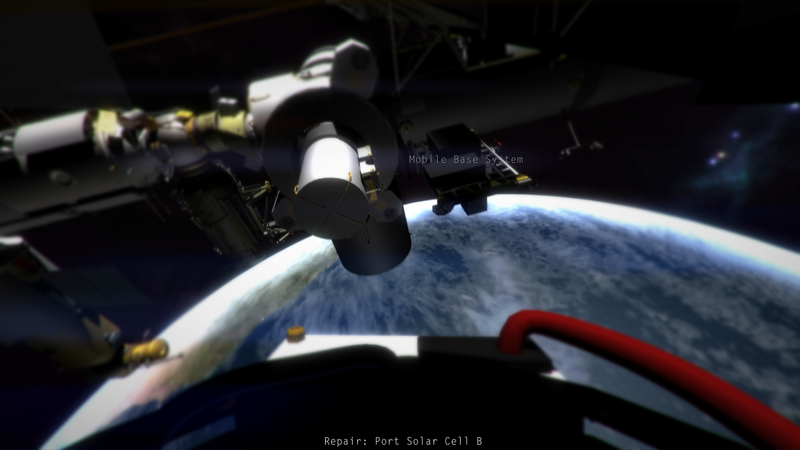 In its original design, “Spacewalk” was a multiplayer game, wherein it was possible to encounter fellow player-astronauts walking the exteriors of the ISS. There’s not much one can do with these players other than have your avatar gesture at them vaguely, but nonetheless, the functionality’s there, and carried over to the Oculus Rift version. I was alone, at first, when I went to space, but soon spotted another astronaut hanging back closely at the boundaries of the station, near where I had entered the game. As the astronaut hung suspended, the sun reflected off the crest of his or her helmet: a light that blinked on and off like a transmission. I had found another Oculus Rift wearer somewhere in the world, and the real world distance between us, however far, had been erased by these strange black boxes strapped to our faces. The limited capacity of the simulation makes communication between players impossible, so I bore down on the astronaut while attempting to signal him by raising and lowering my avatar’s arms in tandem and as rapidly as gravity would allow; looking like a space-suited Donkey Kong. I’d planned my trajectory badly, though – eventually, I overshot him and rolled under his feet. I reached out my hands – my real hands – to catch him. Later, my flatmate explained to me who this second astronaut was. Normally, when you start a game of “Spacewalk”, it creates a new server to put your avatar inside. But this time, the game had accidentally created both a new server and a second client to join that server, spawning two astronauts into space. Both were projections of myself, but as only one could be controlled by me, the second astronaut was dropped into space a stillborn, where it was to forever float lifelessly, frozen in time. And I had chased after a dead projection of my own past self, which escaped my reach.